I have so much coconut, so I’m glad you posted this. I didn’t even think about using it this way. Thank you for participating! Great recipe!! Love using panko!! This sounds fabulous and the idea of using crushed rice crispies instead of panko is clever. Great recipe, I love coconut and considering it’s parve I’m always surprised at the few kosher recipes with it as main ingredient. This looks fantastic! I love coconut crusted foods! I have done this recipe before, and it is delish!!! 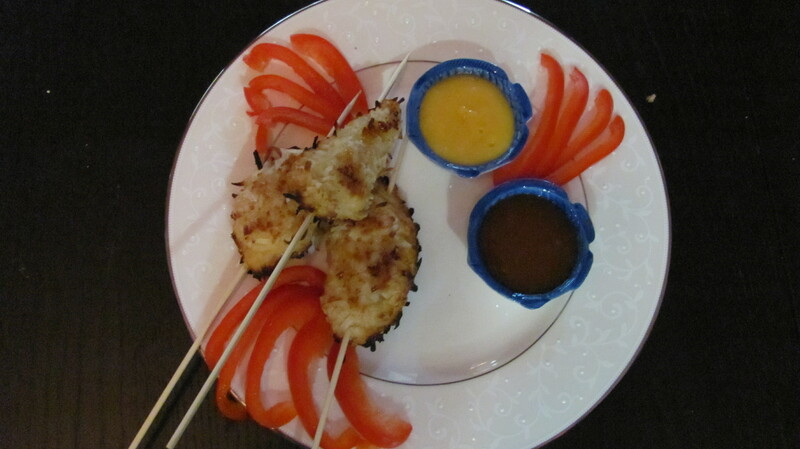 I love coconut crust on chicken and fish and the sauces sound great too. i USUALLY make Pomerania chicken this yr this looks so good I may make this. I had not thought about using a cocnut crust on fish as well but that sounds delicious. I was planning to make my Broiled Sweet and Spicy Salmon with red pepper jelly for RH but maybe I’ll do a coconut fish instead … anyone have a good recipe?